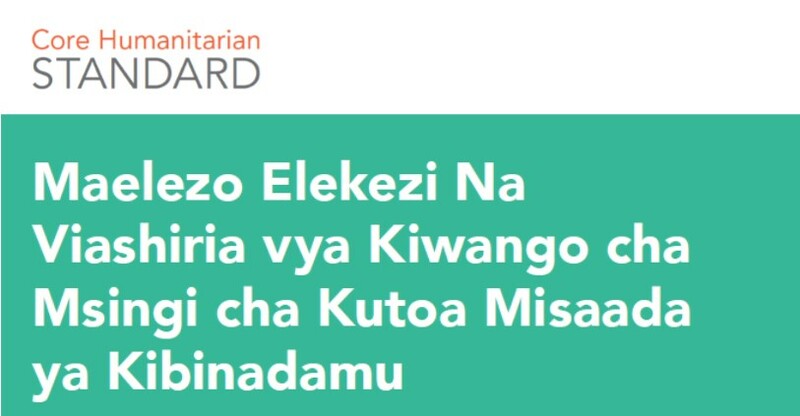 The Core Humanitarian Standard (CHS) Guidance Notes and Indicators is now available in Swahili. The CHS management team would like to thank the Humanitarian Leadership Academy and Tamarind Translations for preparing the translation. The Swahili version will be an invaluable resource for humanitarian and development organisations working across Africa and worldwide. Tamarind Translations is East Africa’s leading Language Service Provider that is entirely focused on professional translation and interpretation services. We offer translations and interpreting into any required language. Since January 2017, Tamarind Translations has been spearheading the translation of Introduction to Core Humanitarian Standard module from English to Swahili for the Humanitarian Leadership Academy in East Africa. We were very privileged to have been part of the contextualization of this module for the East African people. The role of translation in humanitarian work cannot be overrated and through this kind of work, humanitarian workers can access localized knowledge and quality learning opportunities. Having the right kind of knowledge and access to relevant learning opportunities is vital for humanitarian workers to save lives, alleviate suffering and protect human dignity in response to man-made crises or natural disasters. The CHS is now available in 20 languages and the Guidance Notes and Indicators in nine languages. The CHS management team also encourages interested individuals and organisations to translate the CHS and the Guidance Notes and Indicators into other languages. This helps disseminate the document more widely and supports the efforts of humanitarian and development actors to improve the quality and effectiveness of their responses. Those wishing to do so should first email info@corehumanitarianstandard.org for more information and approval from the CHS communications team.